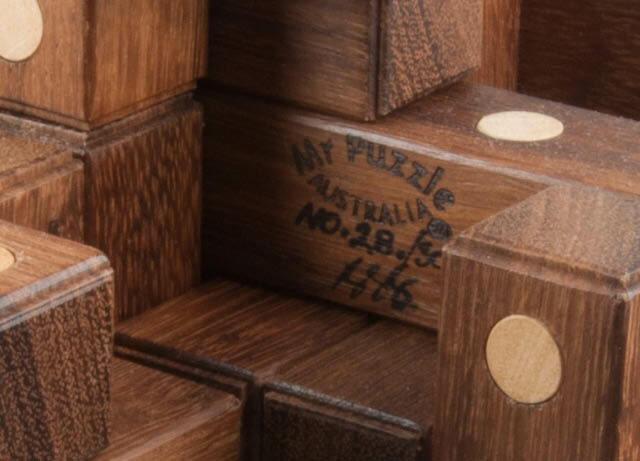 This was the ultimate incarnation of Coffin’s Design #20 – The Pin-Hole Puzzle. 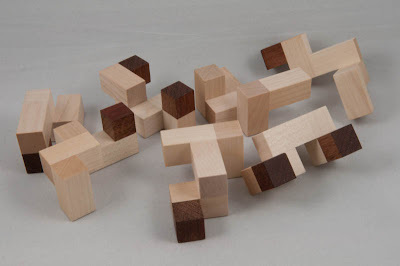 Essentially the Pin-Hole Puzzle is a set of building blocks (think big boys' Tinkertoys!) in a specific number of shapes: the Elbow (the left hand piece), the Pin and the Bar (in the centre) and the Cross (on the right hand side of the base). 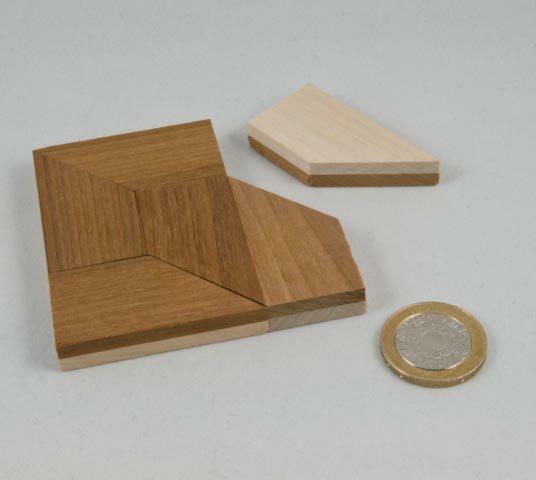 There are also a number of joints (picture an elbow with a bar attached to the unpinned end) for joining bits together. Seeing the dimensions of the puzzle on the web-site is one thing – seeing the pile of wood on your dining room table is another thing entirely! This puzzle is big, and heavy, and I now understand why Sue suggested that she ship my order in two parts – if nothing else, it saved me having to contribute to my postman’s disability benefits! 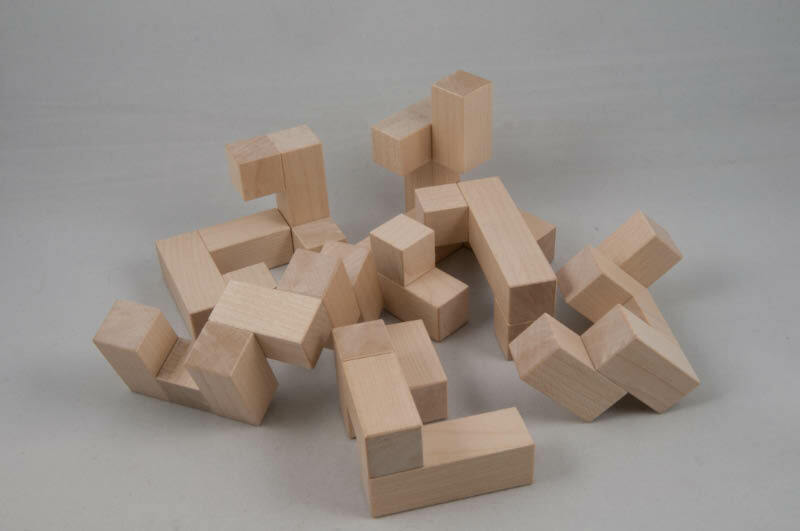 The web-site says it comes assembled, but again Sue suggested that shipping it flat-packed might be a better idea – this results in receiving a pretty large lump o’ lumber – but that lump is infinitely easier to handle, secure and ship... good call Sue! 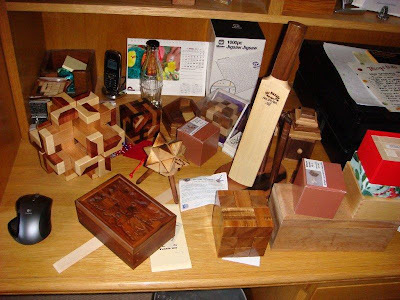 Right, so the lump o' lumber duly arrived on the morning of the MPP2 and it lay in the dining room table all day, and no-one made a serious attempt at constructing anything all day – not a good sign, as these as some of the best puzzlers I know ... what have I let myself in for? Brian’s web-site passes on the following helpful advice: ‘If you're worried about taking the Grand Cross apart Stewart offers the advice that "by persisting with the simpler figures you can gradually become familiar with the more difficult tasks".’ Hoo-boy! The resulting construction is impressive, it really has presence! 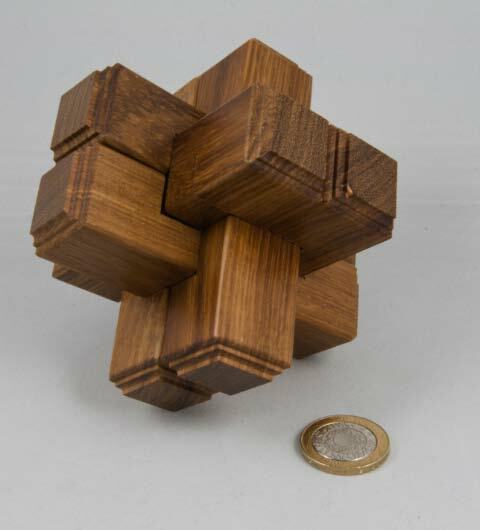 Unlike the previous puzzle, I had managed to find out a little about this one before I ordered it from Kayleb’s Corner. Bernhard Schweitzer helpfully has a short write up in his Puzzlewood Gallery here and the Metagrobology wiki lists it as Stewart Coffin’s design #214. From the description it sounded like it would be a challenging little puzzle, being a development of his well known Convolution Cube, that had itself brought a new twist to an old topic. 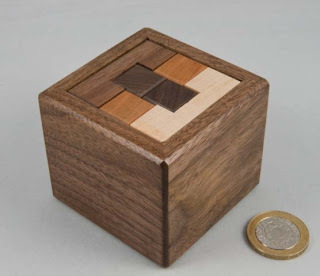 This one was made chiefly of maple and has dark wood corner cubes – that’s got to help, right? 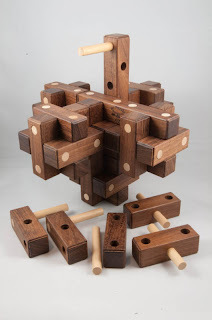 OK, so first off there’s a coded clue in the description of the puzzle that suggests that Burr Tools isn’t going to be a whole lot of use ... Great! There goes the main tool in my attack! But I can take it apart without help, can’t I? Then me hits the usual little brick wall – and I spent a while staring at half a cube with one floppy piece moving around all over the place, but refusing to come free ... so a couple of times I rebuild it and try something different, reckoning that this is a blind alley or a red herring designed to lead the unwary puzzler astray ... and this little 4*4*4 cube is making me feel rather unwary! OK so we go backwards and forwards on that track a couple of times, trying without much luck to find any other alternative moves – nada! 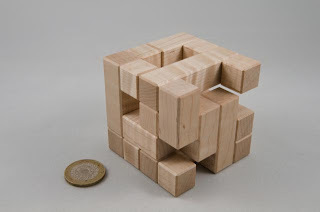 And again this thing feels like the rest of the cube could well be glued together (but I’ve learnt my lesson on that one: Coffin wouldn’t do that, he’s too much of a gent!). I’m quite new to Mr Coffin’s designs, but I’m already a big fan! Thank you sir! 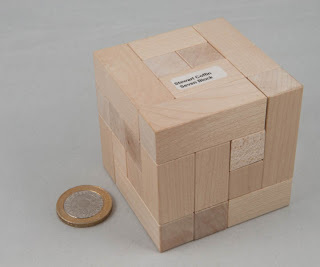 The puzzle came in a cute little decorative box with no particular markings on it, and the puzzle itself is a reasonably non-descript 4*4*4 cube made of maple. 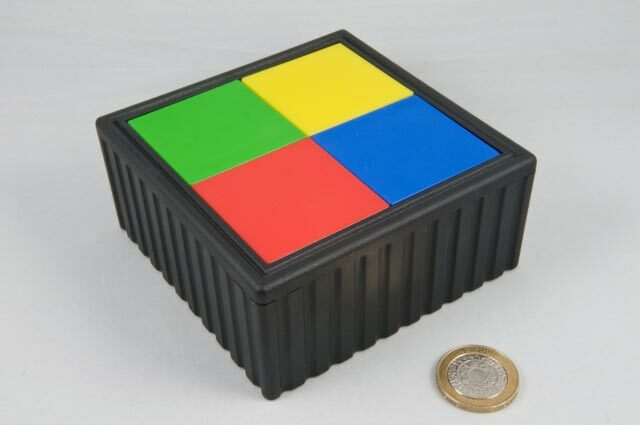 There’s a little white sticker with the words ”Stewart Coffin Seven Block “ on one side, but other than that, it looks just like a simple cube construction. So you take it out of the box carefully, just so that it doesn’t fall apart (Yeah, right! Little did I know...) and start looking at the cube – no obvious easy ways in, no pieces trying to make a bid for freedom yet – looks nice. 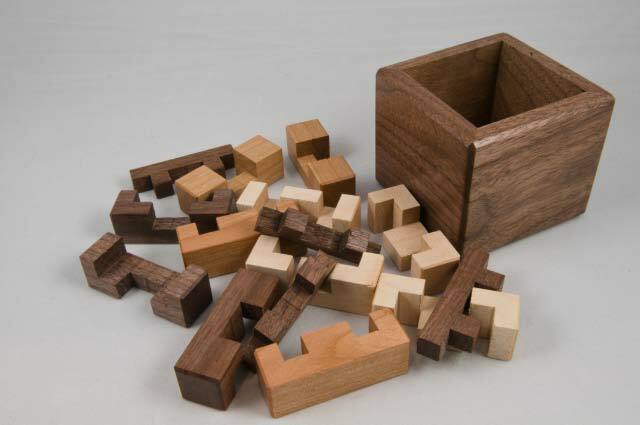 Hmmm, maybe it’s one of those in-jokes, you know the ones where the pieces are all actually glued together? Given how little movement there is between the pieces, this could actually be feasible! Puts it away to think some more ... and laugh at the fact that I was worried about it falling apart or not presenting much of a challenge! 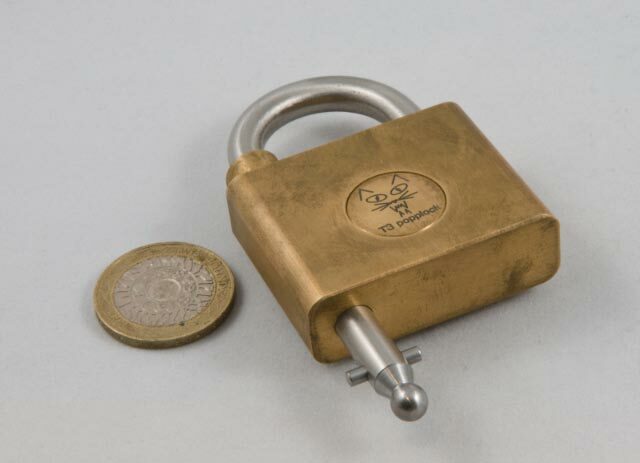 A couple of sessions later I finally manage to work out how the key piece works, and it’s brilliant! While I was writing up this post I got hold of Georges to ask him about the puzzle and it turns out it came from Bernhard Schweitzer and there’s a short write-up in Bernhard’s Puzzlewood Gallery. Late addendum: I had to smile when I noticed this... I'd used my favourite search engine when I was trying to find out about this puzzle, and turned up not a lot... so I had to smile when I noticed that one of the traffic sources for for my blog was in fact a Google search for "stewart coffin seven block" - and this is now the first page you get when you search for that... which just goes to show that not enough people have been writing about this puzzle on the web! At our get-together last weekend, Oli gave me a set of his soma dice, and I was quite touched by the gift. They’re his first go at producing his own puzzles and you can read about his adventures in making his first puzzles on his blog over here. This set uses the standard soma pieces and incorporates the dice rather nicely – so each side has a symmetrical colouring from the dice themselves and shows a single number on all dice making up the face – making a dice of die, or a die of dice? 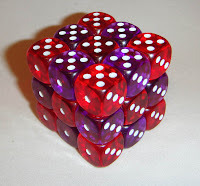 I know, a big dice made up of smaller ones! 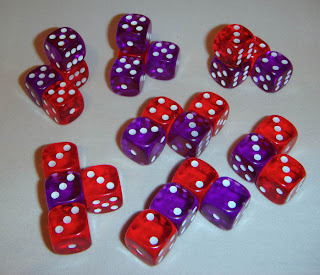 Right, so when Oli gave them to me, he gave me a question at the same time: did I think the dice element (i.e. needing to get the faces lined up) made the puzzle easier or harder? And this is where I could use your opinions, dear readers ... because I’m conflicted: I find that the way I naturally set about solving this puzzle is to work out likely outside edges for each piece, narrow that down a bit (there are one or two that won’t really work), then build one side, then add a layer and then top it off, paying attention to the numbers as you progress ... which is totally different to how you’d solve any other (blank) soma cube – but I find it quite straight-forward and simple this way (please remember my earlier comments about being a second-rate puzzler!!). 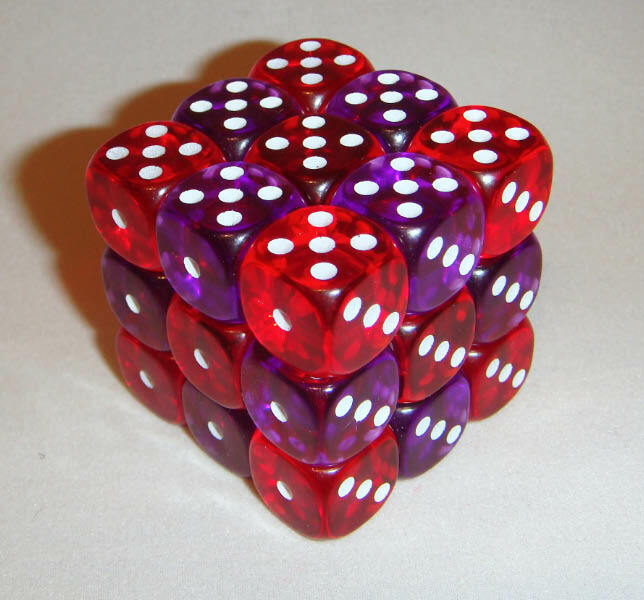 So the conflicting bit for me is this – I think I find it easier to build it up from the numbers (and I don’t ever end up with a wrong-shaped piece at the end, but my brain tells me that by adding constraints to the faces, through colouring and numbers, reduces the degrees of freedom you have significantly (i.e. the total number of potential solutions reduces, a lot) so it must be harder... or is it just that the brain compensates for the constraints and uses them accordingly? Thanks Oli – for a very thoughtful gift. Sometimes the planets align and deliver a really special treat – I kinda feel they did that to me over the past week ... I’d lined up a week’s holiday between Easter and the royal wedding and I’d been looking forward to it for some time. Now in the previous post, I’d mentioned that last Saturday I’d received two packages of puzzles – one contained a special TRIGO cube from Mike Toulouzas and the other had a few goodies from Mr Puzzle – that’s Louis on the right poring over the Siamese Locked Nest, Pinhole Grand Cross (needs some assembly), a Flying Puzzle and an All for One. 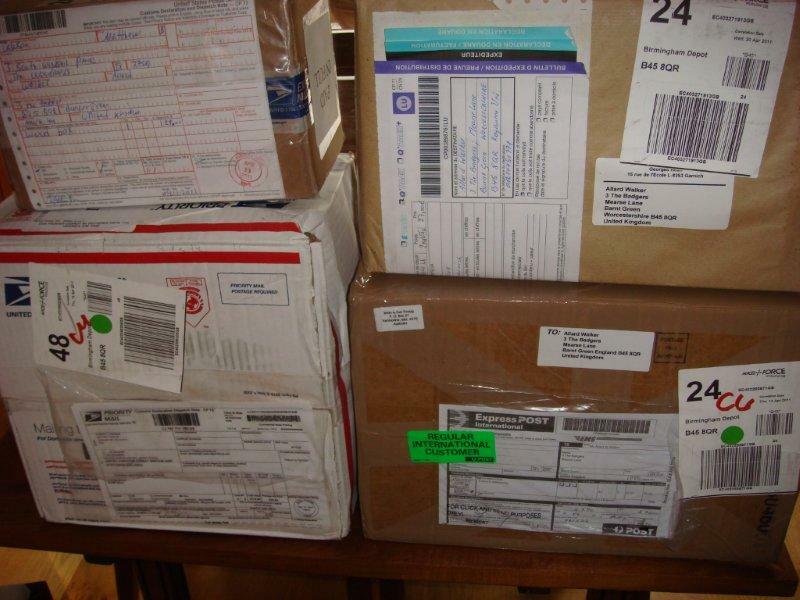 On Tuesday I received a little package from Scott Peterson with a couple of Coffins (only on a puzzle blog would that be both socially acceptable and make sense!) 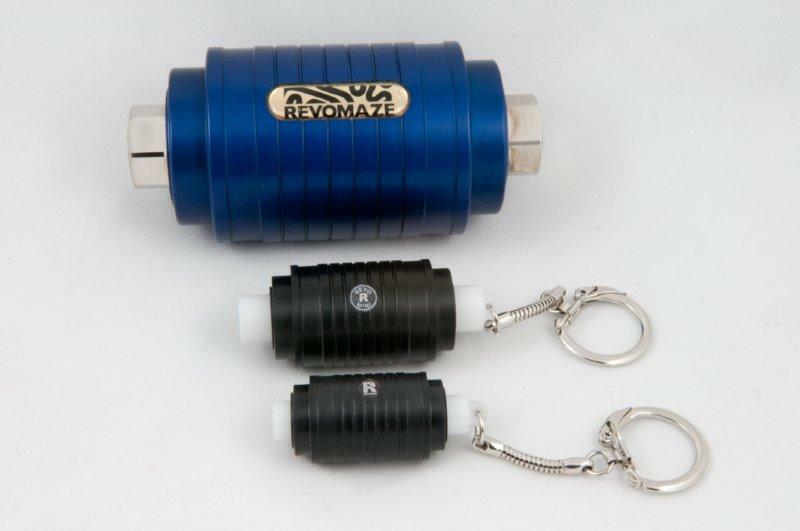 – a Super Nova and a Rosebud ... you’ll be hearing a lot more about those! 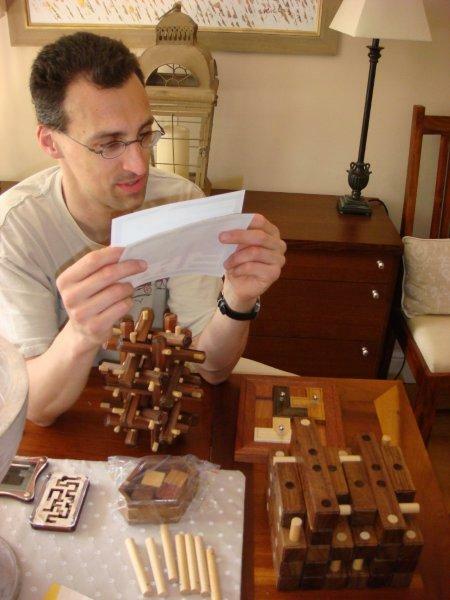 Saturday saw the second gathering of puzzlers under the Midlands Puzzle Party banner. Once again Louis took the prize for the furthest travelled (he flew in from Holland for the weekend, again! Thanks for my Svetnashki Louis.) Oli and Ali came from the other side of London somewhere and Karl joined us from the other end of Birmingham. 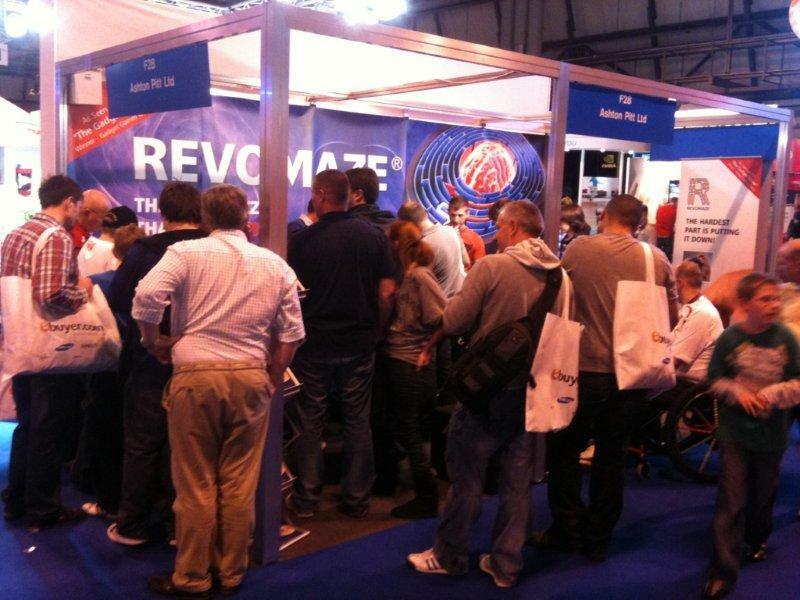 We met at my place for an afternoon of puzzling (and caffeine) and then we all decamped to a pub near the NEC for the evening, where we were joined by the hard-working crowd from the Revomaze stand (for yet more puzzling). Everyone brought what they had in the afternoon and it was noticeable that quite a few folks had been spending a bit on puzzles since our last get together. As luck would have it I’d received a few nice bits from Mr Puzzle that morning, so I just left them out for everyone to play with – my new Stickmen were all out for everyone to have a go on and most people fiddled around a little, although I suspect that Oli was the only one who had any real success on them during the MPP – Louis made sure he polished off all of them during the weekend at my place, so he probably bagged the most Stick-scalps over the course of the weekend. 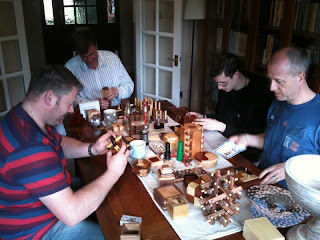 Oli had brought along his Sandfield Salt and Pepper cellars for me to play with, but sadly I was too thick to do any more than play with the magnets a bit – essentially I got nowhere, but I got to see firsthand how brilliant these little guys look – Perry McDaniel really is a wizard at fine trick dovetails. There was a lovely selection of Vinco’s on display with most folks taking a turn at opening and closing them and watching the mesmerising interplay of exploding bits and elegant co-ordinated motion. I spent a while fiddling with Roger’s Propeller (not much joy there either!) although I did have a wee bit more joy confirming that my solution for Roger’s R2D2 did in fact work ... although I failed miserably on Alles Roger. A couple of Wil Strijbos’ puzzle bottles kept a few folks quiet for a good while... and if I can work out how to get the chain locked inside the bottle again (without using a pencil, ahem!) I’ll be a happy man! Anyway, by meeting up at the pub, we could see the guys from the stand without them having to go too far out of their way from the NEC – unfortunately I hadn’t checked out the pub properly beforehand and booked a table, as a result we could sit outside with drinks (thankfully the weather was rather kind!) but we couldn’t get anything to eat. (Sorry guys!) A couple of times during the evening, someone would ask if we were going to get some food somewhere else, but there were too many puzzles around for them to be taken seriously and we ended up staying there for the evening. 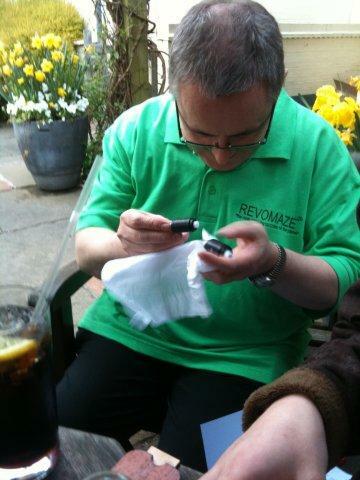 While we were at the pub (before we realised that we wouldn’t be able to get any food!) Nigel gave me a Pentangle Vertigo burr as a thank you ... thank you, mate. 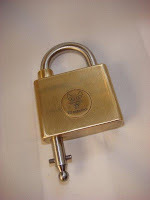 From what I’ve read, Rainer uses a friend’s machine shop after hours to make his wares, so his production runs will be reasonably modest, however they’re all being precision-made by a bloke who understands not only good puzzles, but also how to craft them from lumps of metal – they’re not only really unusual good-looking locks, but they’re excellent puzzles as well! So far my collection of Popplocks runs from T2 to T5 – each one is totally unique both in terms of mechanism and in terms of looks – and this one, T3, is my favourite. 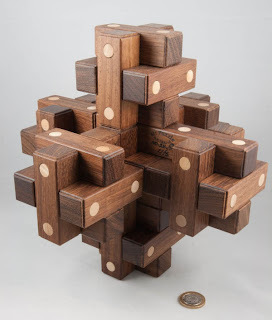 It’s a simple puzzle that stands on its own and will hold its own against most comers. Right, so start playing around with it and work out why sometimes you can turn that dial, and sometimes you can’t, and what that means to you – then enjoy the brick wall that Rainer throws at you for quite some time until you notice something so subtle it’s almost criminal! Remember I said that these things were precision- made? That little step in there is just so well disguised that it’ll keep most puzzlers locked out for days ... release the doo-hickey and the lock Popps open :-) – in total there are probably only two or three real ‘moves’ to opening a T3, but I guarantee it’ll amuse you for quite some time trying to find what you need to do ... masterfully hidden, clever design, lovely puzzle! OK, so as puzzles go, it’s not going to stop a hardened puzzler for very long, but it’s cute, and it’ll entertain non-puzzlers for a while – in fact it’s one of my old favourites for giving someone to fiddle with if they look a bit intimidated by some of the more complicated looking puzzles – who can resist a 4-piece jigsaw, after all? Cool thing is that they seem to pop up all over the place – in different materials – I found the wooden one online recently and couldn’t resist adding it to the hoard and the Hanayama Cast Spiral takes the same concept to another plane altogether ... not just by adding an extra piece and changing the shapes, but being made from cast metal, the tolerances are pretty fine and you need to get things just so before making your move – as a result, your chances of fluking a solution are reasonably small. This was another of my Cubic Dissection finds. 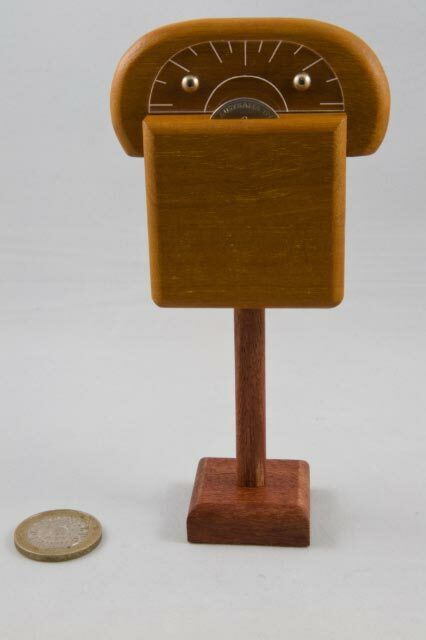 It’s a Tom Jolly design made by Eric Fuller from curly maple. It’s made up of two pieces in a 4*4*4 cube shape, interlocked, but with plenty of space in there. 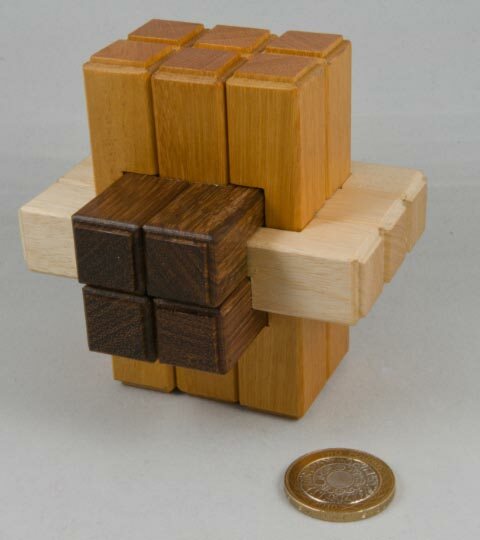 The object is to separate the two pieces and put them back together again. Without using any force, i.e. if it doesn’t feel like that will work, it won’t - STOP. When you first start playing around with the Tangler, there’s plenty to do ... and usually with this sort of puzzle, wandering around aimlessly will teach you a bit about what you can and can’t do, and even sometimes see you solving it ... or not! Solving this one requires some out-the-box thinking and knowing where and when to apply it, as the amount of movement available means there is plenty of scope for blind alleys and dead ends. So far everyone who’s played with this one has enjoyed it ... so it must be good! 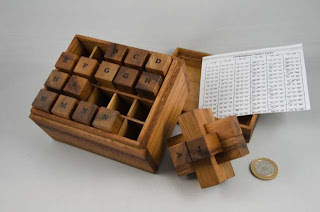 (I may have mentioned this before, and I’ll certainly keep saying it in the future... but ...) I really like puzzles that look like they must be stupidly simple, and then totally blow your mind ... Blockhead by Bill Cutler is definitely one of those puzzles. It’s a packing puzzle that consists of a walnut frame and four square cherry wood blocks sitting neatly, even squarely, in the frame. Right this’ll be tough then! So you tip the blocks out of the frame and then put them back in, at which point you notice that things weren’t quite as they seemed when the bits were in the frame ... in fact, those neat square blocks now look anything but square! 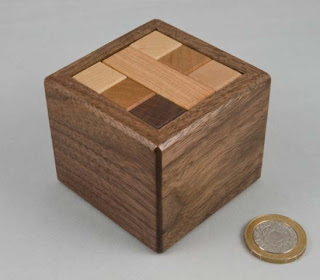 It’s a lovely, simple looking puzzle that will keep folks entertained for quite some time – once you work out the trick to getting that final piece in, you realise there’s a lot of subtlety to those simple looking blocks – John Devost has done a lovely job of making these for Bill – the frame is beautifully finished and the blocks ‘work’ really well – totally innocuous one minute and fiendish the next. When I enquired about buying this from Bill, he tried to dissuade me from buying the lovely wooden one on the grounds that the cheaper plastic version, that he had a couple left of, actually had better fitting pieces ... so I did what any hoarder would do in my position and asked for one of each – Bill’s a jolly good salesman, I suspect! And he was absolutely right, the fit on the plastic version is a lot tighter, but John D’s wooden version just looks the business! 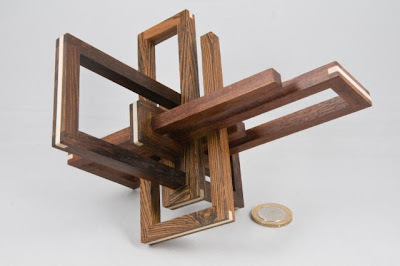 This was Brian Young’s Exchange Puzzle at the Gold Coast IPP in 2007 – modelled after the distinctive golden coloured parking meters installed along the Gold Coast in the 1960’s. There’s a lovely story on Brian’s web site about bikini-clad ladies causing a bit of a stir feeding expired meters along the Gold Cost to stop tourists from getting parking fines. For some reason when Brian used a suitably attired young lady as his assistant to hand out puzzles at the exchange, it went down rather well. As a sequential discovery puzzle, it looks pretty unusual – you don’t generally come across puzzles shaped like parking meters very often for one thing, and for another, the object is to get the money (a 10 cent piece in this case) into the puzzle ... the coin projects out of a slot a bit and it clearly won’t just get pushed in, so you need to explore a bit. There’s a reasonably obvious place to start: there are a couple of tell-tale signs on the sides of some moving blocks, but they seem stuck pretty solid at first ... so you explore a few more things – and at this point it might be wise to point out to any rather ham-fisted wannabe puzzlers that the base and stand do not come apart and breaking them off will not help you solve the puzzle ... and yes, I’ve had to warn one or two folks – some of my mates can be way more enthusiastic than clever ... and I guess that probably says a bit about me as well! Right, so the base won’t help, and unless you have enormous fingernails, you’re not going to prise out the pins holding the dial in place (and that wouldn’t be a good idea either) – so you go back to working on the sides – and applying a little brain power will release a couple of blocks – but that coin is still stuck in place and a lot of fiddling, and using what you’ve found will get you past the next hurdle – which will let you put in the coin into the meter and then put it all back together again. The mechanism itself isn’t overly complicated, but it’s beautifully disguised and very nicely executed ... and Brian’s added a couple of his favourite little tricks to slow you down along the way. It’s one of those puzzles that puts a smile on your face. Right, so everyone knows that Bill knows burrs – his research into 6 piece burrs is legendary and probably forms the basis of mainstream burr-knowledge and notation in use today. Bill’s used a number of the burrs resulting from his exhaustive research as the basis for some lovely puzzles, adding the odd twist here and there (“Would sir like ball bearings in that?”) and letting some of them stand on their own (Computer’s Choice?). At some point during this work, Bill decided to try something a little different – and this led to the Wausau series of burrs. Not content with just having different shaped burrs, Bill also designed the mechanisms to be ‘interesting’ – so every now and then, one of them will move in a totally unexpected way – in fact quite often, prodding and pulling in ‘the usual way’ won’t get you anywhere … I like puzzles that catch you out by making you assume you ‘know’ something … then sneak up behind you and yell ”BOO!”. Most of the Wausau’s has a “BOO!” in there somewhere. There are four in the series – numbered ’81 through ’84 (‘cos they were designed in the early 80’s). 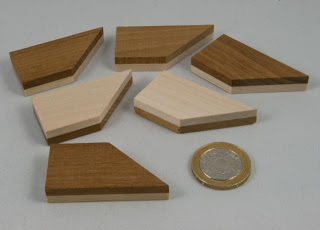 The first in the Wausau series has a different pattern of 4 sticks on each plane! 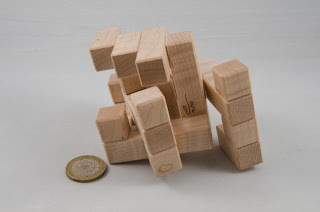 It looks different ... fiddling around with it quickly reinforces that ... it only takes a few moves to remove the first piece, however there are a number of false starts and little blind alleys that will keep ham-fisted puzzlers at bay for ages. Bill described this one politely as being “non-trivial to take apart”. 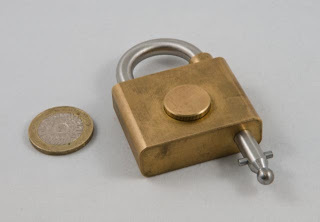 There is one that’s often known as the lock-picking one because there’s a bit in the solution where you find yourself effectively trying to “pick a lock” using the pieces in one of the planes as a set of mortises while trying to slide some in an intersecting plane out. The amount of movement is again, unexpected, and will keep overly enthusiastic puzzlers occupied needlessly for hours. Once the lock’s been picked, it’s a pretty straight-forward disassembly… this was Cutler’s favourite of the Wausau series. This was the last one I received and is an absolute delight – there are a few pseudo-standard burr moves and then you seem to hit a brick wall –prodding and pulling in “the usual way” will get you absolutely nowhere, so you need to start trying more unusual moves – and I have to say that the one that finally does it is a really unusual – almost magical movement. 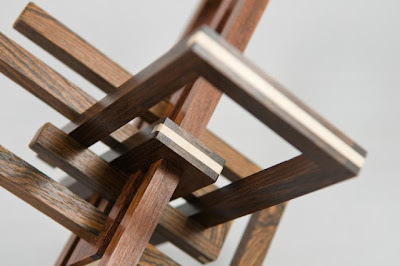 From there on out, it’s a simple matter of removing a piece or two at a time – reassembly on the other hand is quite tricky – mainly because of that funky move, that means you need to get things lined up a bit funky before it all locks together nicely … easily my favourite of the series. 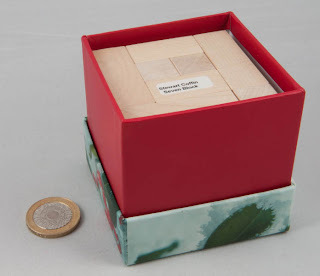 If memory serves, this was the second item I ordered from Cubic Dissections – it looked lovely in the pictures on the site and they had some in stock. Any questions? The box duly arrived from the US and on opening the package my heart absolutely sank when I noticed a couple of bits of loose wood – thinking the worst: the damn postal service has broken my new puzzle, I investigate further – but everything looks fine … then I realised that Eric has stacked the three pieces and placed two sticks between the outsides of the three paperclips, simultaneously joining them together so that they won’t move around in transit and turning the three potentially fragile pieces into a single, solid unit…bright boy that Fuller! 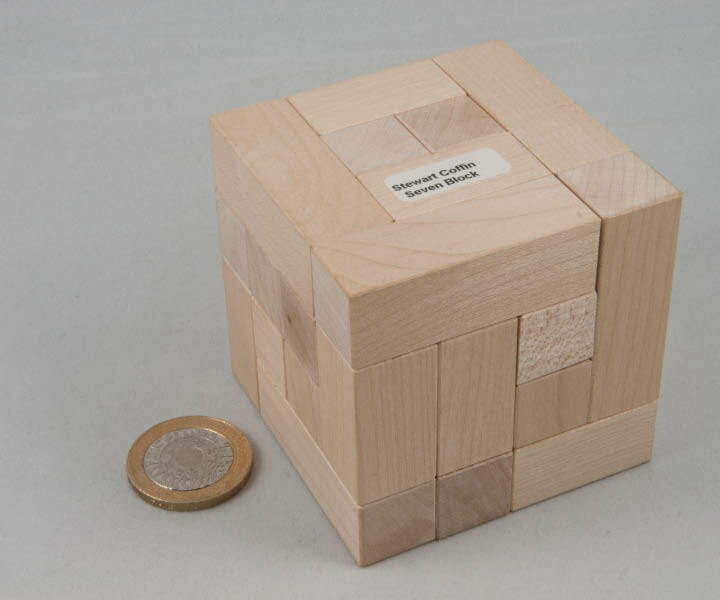 The packaging had done its job perfectly and the puzzle was in pristine shape. And the pieces aren’t fragile as you might expect from a structure with relatively small joints and long arms. 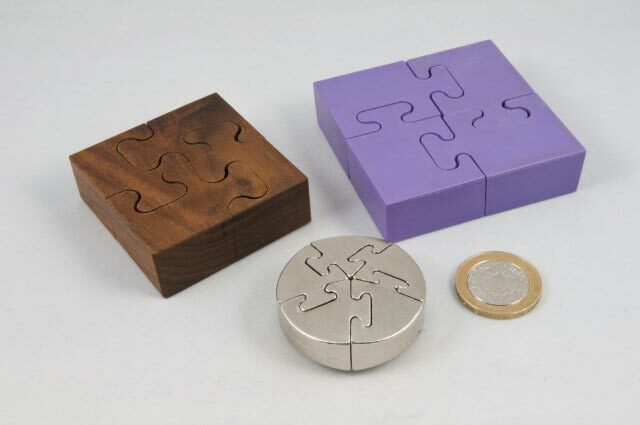 First impressions really count and this puzzle looks gorgeous. 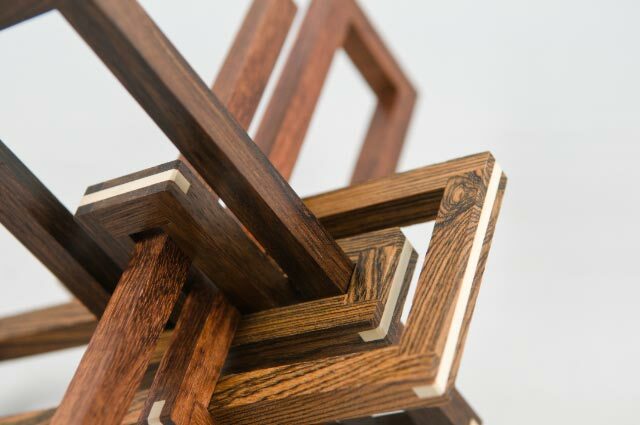 The attention to detail on the paperclips is incredible – the splines across each joint in a contrasting wood not only look smashing, but really strengthen the weakest part of each piece. Each paperclip is slightly different in terms of size and orientation and they’re made in three woods. The fit between the clips is spot-on and a little experimentation quickly establishes what the end-state will need to be in order to get all three paperclips properly interlocked at their centre. I suppose the right thing to do is to think of them as forming a really large, loose three piece burr – but I’m rubbish at burrs, so I just fiddled with them – sometimes I’d get reasonably close to the end-state only to realise that I’d totally locked myself out of getting the last piece into the right place… after a couple of weeks of on-and-off experimentation, I finally relented and asked Eric for a copy of the solution (in fairness, Eric’s description says: “At 14 moves, finding the solution to this work of art is no trivial task either. 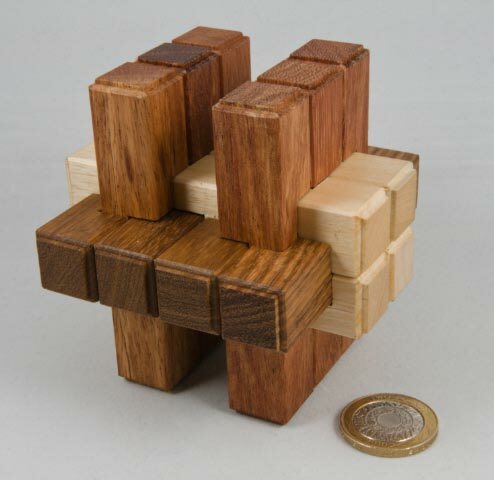 It is a very confusing and difficult puzzle to solve.”) … thus confirming earlier references to second class puzzler! 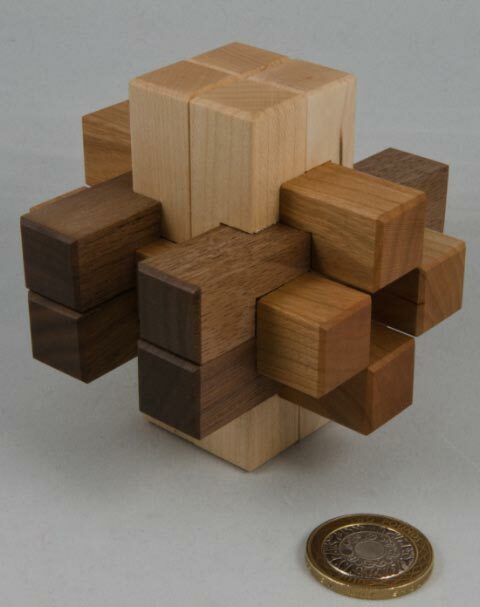 This example was made by Eric Fuller in 2010 and uses Bocote, Jacaranda Pardo and Grenadilla wood with Holly splines, and yes, it’s an Oskar van Deventer design – his name seems to pop up quite a bit in my little collection – not sure if that says anything about my tastes in puzzles or his prodigious ability to design interesting puzzles … yeah, it’s probably all of the above! A couple of weeks back I plucked up the courage to drop a few leading lights in the puzzling community an email asking them whether they had any puzzles in stock – one of those was Jerry McFarland ... I’d come across his web-site some time ago and had marvelled at some the equipment that Jerry has in his workshop – clearly he’s serious about making stunning puzzles. 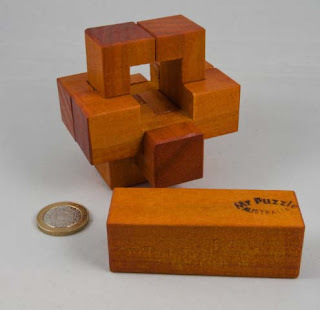 As luck would have it, Jerry didn’t have the puzzles I was after (and in fairness that’s what his web-site was saying too, but I asked anyway!) 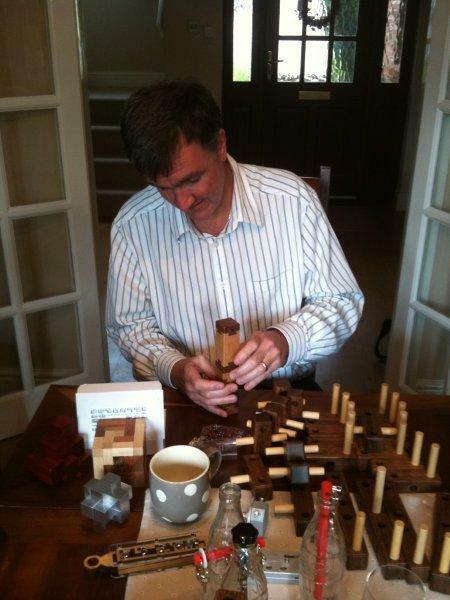 but he mentioned that he was putting together a new puzzle of his own design and asked if I’d be interested. 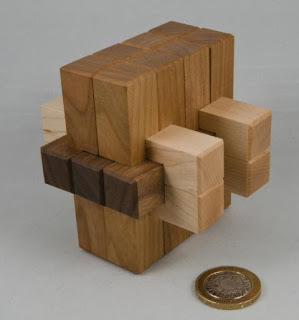 Jerry’s Burrcube#1 (because it’s a burr, in a cube, the first one, and there may be more along ...) is described as a 3*3*3 cube in a box that’s made up of 15 pieces – it sounded interesting and he was offering it at a jolly good price because he was interested in some feedback ... I couldn’t turn down an offer like that! 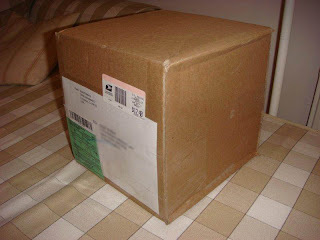 About a week later a box arrived from Jerry containing a Lovely Burr (I’ll get to that one when I’ve worked out how the heck to get it apart! ), a nicely made 5 sided cube and a bag of bits ... object of the Burrcube#1 is to decant bag of bits into box ... but there’s effectively only one way to do that, and the photo that Jerry had of the completed puzzle in the cube deliberately shows you the least useful side ... nice guy, that Jerry! First off, the bits are all beautifully made – just like everything else that I’ve seen from Jerry. When I initially said that I’d like one, Jerry was a bit apologetic that he hadn’t knocked up any boxes yet, so I got the impression that he was going to knock up something quickly on his table saw - the initial pics I saw had a ply box – which at the price point wasn’t out of place! 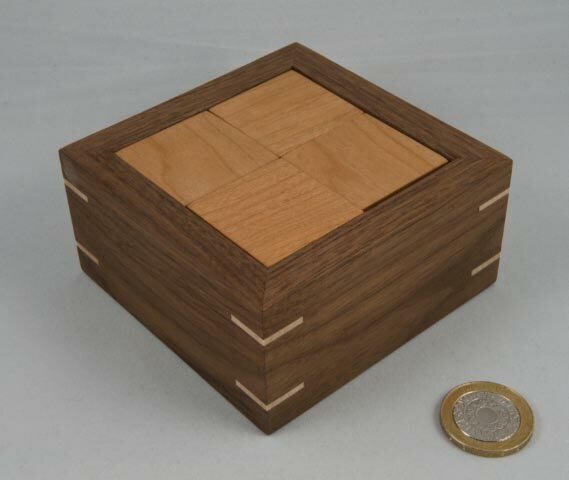 I certainly wasn’t expecting a beautifully finished walnut box with Jerry’s initials stamped on the bottom along with the serial number 002 ... the inside bits are made in cherry, maple and walnut and are all finished beautifully and fit perfectly. There are a couple of unusual shapes in there. So for most of the past 4 or 5 years (i.e. most of my puzzling life) I’ve avoided burrs – sure I’d played with the odd burr when I stumbled across it from time to time (although I never inhaled, m’lord) but I’d never really tried to understand them and get to grips with them. 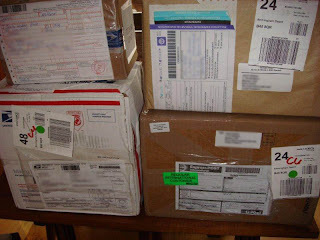 I’d certainly come across some pretty incredible, analytical web-sites dedicated to all things burr, but my prejudices won out…until about a year ago, when I decided that I needed to face my fears and “get into” burrs, so I did what every self respecting puzzler does, and bought handfuls of them…most of them from Mr Puzzle, and a really useful burr set from Philos. This is a really simple, plain vanilla 6-piece burr. It’s sort of the dummies guide to burrs. That’s why I started there. Baby-steps, baby-steps. 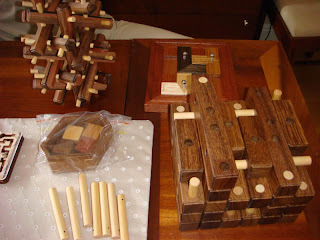 It arrives disassembled, look at the pieces and you can see how the different pieces can slot together. 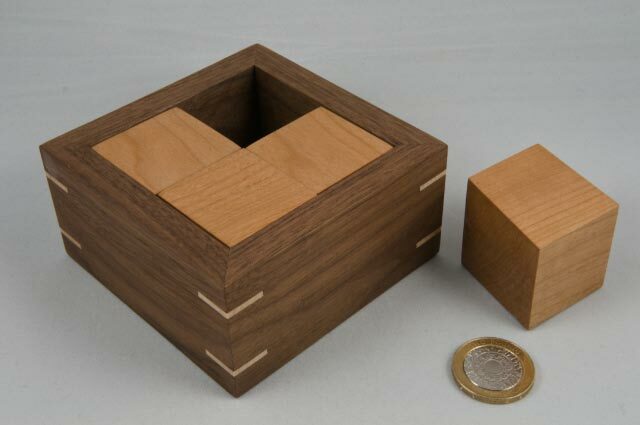 Notice the key piece (that solid plank without any notches) – that one’s going in last, so you need an assembly that looks almost like a completed burr, with a single hole right through the middle that you can slot the key piece into. Like I said, this one’s a simple design, so it lets you just assemble the first five pieces without much bother and slide in the last piece. That’s not so bad…maybe I’ll give these burr things a bash after all. Next up is a set of 20 individual burr pieces – most of them different, with a couple of duplicates … but this set will enable you to build 151 different burrs (ignoring rotations). It comes with a list of pieces that will each build into a six piece burr, starting with reasonably straight forward assemblies and ending with some slightly less trivial examples. To me this is the equivalent of a burr skills-building exercise – start at the beginning of the list, select the 6 pieces and build a burr. Cross it off the list, repeat, until end, go! 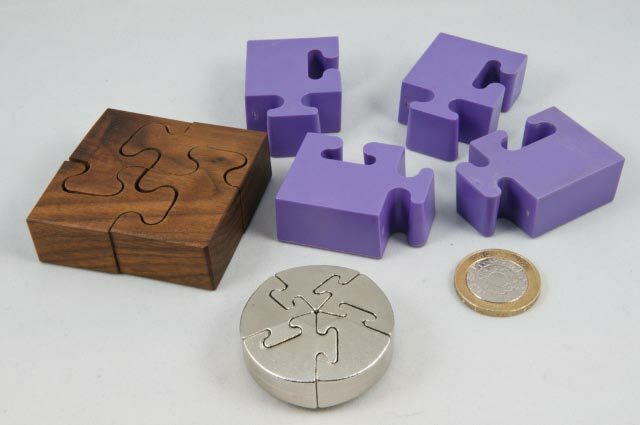 This little set is tremendous value at about EUR 20 (I got mine from “Toys for all” in Germany – it literally gave me hours of fun playing with different burrs and learning to ‘see’ different assemblies. The first few use a key piece and are quite straight forward, then you start using just notched pieces and by the end you’re having to introduce pieces sequentially and manipulate the whole assembly in order to get things into their final shape. Spending a few hours with this set helped me get past my mental block about burrs. I got a Mega Six from Mr Puzzle because it claimed to be the daddy as far as six-piece burrs go. 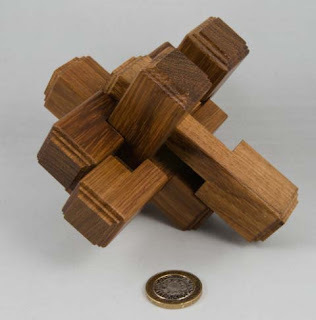 [Okay, technically it claims: “The puzzle is incredibly more complicated than the commonly known six piece puzzle”] This was derived from one of the designs that Bill Cutler’s seminal research on burrs uncovered as having the deepest level for a six piece burr (i.e. 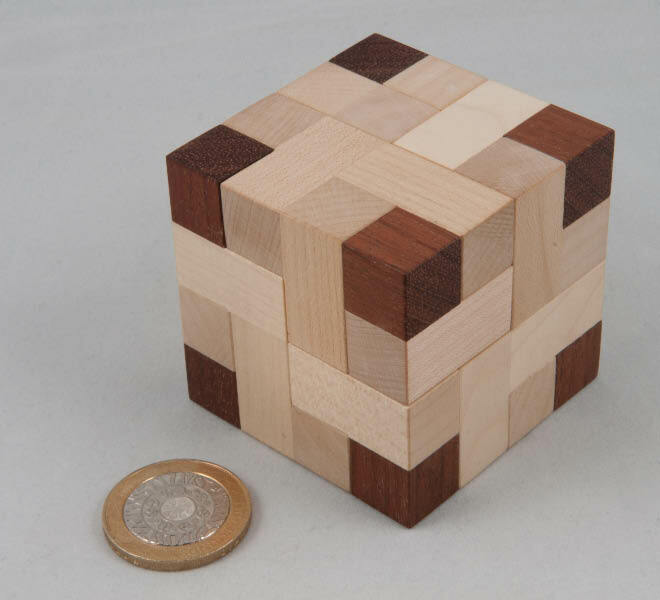 most moves to remove the first piece). 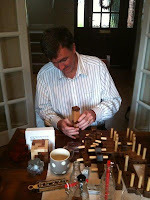 It takes a monumental 10 moves (including some multiple piece moves) to remove the first piece from the assembled burr. 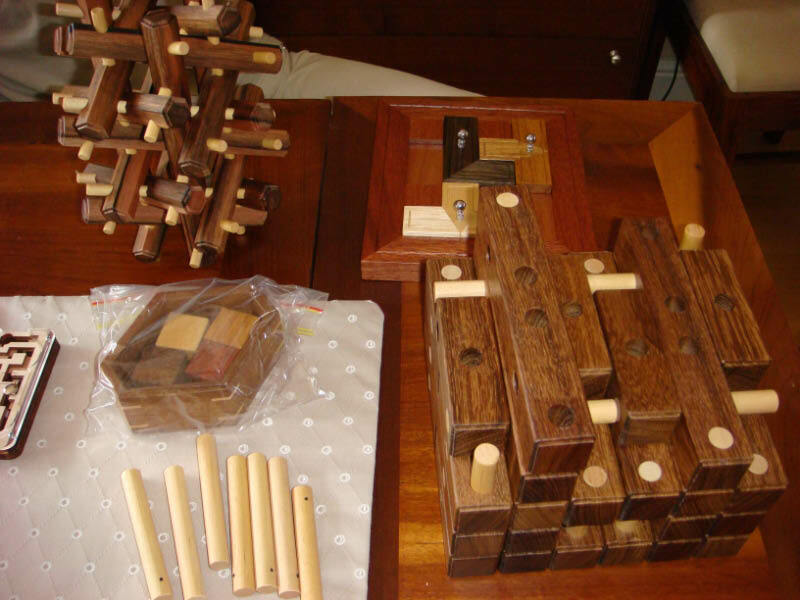 Theoretically there are twenty assemblies for this set of pieces, practically speaking only one is feasible – I’m guessing because most puzzlers only have two hands and have to obey the law of gravity, most of the time! Solving it, i.e. reassembling it without the assistance of a solution sheet, is quite simply beyond me – the movements are that complex that even if you can work out which pieces lie where in the solved state, working back and establishing what would have to move where to allow the assembly, is simply beyond me (see, second class puzzler!). Having said that, using a set of Brian’s really clear instructions make it possible, but it remains an exercise in dexterity and concentration – mine had a set of masking tape numbers on each piece to make following the instructions easier for ages, and it was still fiddly and confusing. It’s a tough burr – tougher than me! But I’m a puzzler, so I have to have one – and who knows, maybe one day I’ll be good enough to be able to work it out for myself! Burr Tools - this free software is incredible! It lets you define all sorts of problems and then works out how to solve them.